1. What a difference a win makes! Had Wigan lost, it would have been their sixth straight defeat and seen the club suffer their worst start to a season since, gulp, 1899. Instead, they won, they moved clear of bottom-club Leeds and are now only four points behind the team (Salford) in fourth-spot... with a game in hand! With the Shaun Edwards coaching circus still rumbling on, it provided some much-needed joy for the Wigan staff, players and supporters. 2. To the game itself, and in hindsight, it would have been good for TV. At £27 for a walk-up ticket, it is doubtful there were any neutrals at the AJ Bell – but if there were, they got a free-scoring, seesawing spectacle in which the lead exchanged hands four times. 3. George Williams. 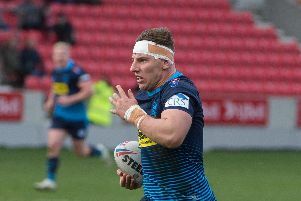 The England halfback finished off a long-range attack to secure his hat-trick – his first since a treble against Hull FC as a teenager five years ago. He troubled Salford with his direct attacks and reaped the rewards with his 12 points. But it was just as pleasing to see him reunite with childhood friends Joe Burgess and Oliver Gildart on the left flank. Burgess looked sharp and rapid, considering he has been out for 11 months with a knee injury (this was his first match alongside Dom Manfredi since the 2015 Grand Final!). With the impressive Joe Greenwood also on that left side, Adrian Lam believes Wigan could have one of the most lethal edges in Super League. 4. Salford have shown this season what a quality outfit they are and in five minutes of play, they managed to turn an 18-6 deficit into a 22-18 lead just after half-time. But Wigan did well to keep their composure when they could easily have crumbled, and showed good game-management to secure a victory which will swell their confidence before the visit of Catalans on Sunday. 5. Finally, the visit of Catalans will inevitably be dominated by the return of Sam Tomkins – but what about his replacement at Wigan, Zak Hardaker? After a year out, and settling into a new side, it was always going to take him time to find his best form – and he is still a way off scaling past heights. But, as he progresses, he has still been one of Wigan’s most consistent performers this season. He showed his defensive mettle with an incredible tackle on Ben Currie a week earlier, and against Salford he carried the ball well and kicked five goals from as many attempts.